Pressure washers have come a long way. Over the last ten years the quality has increased as prices have become more affordable. The cleaning ability of a pressure washer is great, removing dirt, grime, and algae quickly, efficiently and effectively. A pressure washer can greatly increase your ability to maintain and clean your property and equipment giving it greater value. If your time is valuable, a pressure washer could be a good investment, but if you get the wrong machine, you will be frustrated and you could waste a lot of time and money. A pressure washer is actually a fairly simple piece of equipment. A motor or engine turns a pump, pushing water through an orifice (tip). The water accelerates as it goes through the small hole, much like a river flows faster in a narrow gorge, and that fast-moving water is very useful for blasting dirt and grime. The math is quite simple. Each time the pump turns over, a specific volume of water is pushed through the tip. The more water you push through the tip, the more pressure is developed, and therefore more power is required. The higher the pressure, the faster the water moves, and the harder it hits the dirt, removing it from the surface you want to clean. The two most important considerations when buying a pressure washer are size, which determines how long it takes to do the job or how many jobs you can do in a day; and life expectancy, which determines how many hours of work you can do per dollar spent during the life of the machine. This is how much power the engine or motor produces. This rating is important because it directly relates to how much pressure and volume the pump can produce. The pressure generated by a pressure washer is measured in pounds per square inch or PSI. Pressure contributes to the cleaning force. The water volume produced by a pressure washer is measured in gallons per minute or GPM. Volume also contributes to the cleaning force. Cleaning Power Units quantifies a pressure washer’s cleaning ability. To determine CPU, multiply GPM x PSI. The greater the CPU, the greater the ability the machine has for cleaning deeply and effectively. Often consumers are so focused on the PSI rating of the machine, they do not consider the CPU. For example, a pressure washer may have a rating of 2,800 PSI and 2 GPM, giving it a CPU of 5,600. Another pressure washer is rated for 2,400 PSI and 4 GPM. That’s a CPU rating of 9,600. In this example the lower PSI machine has more than 40% greater cleaning power than the higher PSI machine. The result is that the 2,400 PSI machine will be able to clean an area 40% faster than the 2,800 PSI machine. Now consider this: A garden hose typically provides 6 GPM at 10 PSI giving it 60 CPU. With a standard spray nozzle attached to the garden hose you can get around 5 GPM at about 40 PSI generating 200 CPU. We all have seen the difference of how much more effective a simple spray nozzle is at cleaning dirt off surfaces. Trying to clean your driveway with your garden hose spray nozzle generating 200 CPU is fairly ineffective. However, if we take a mid-range pressure washer rated at 2.0 GPM and 2,500 PSI (5,000 CPU), the CPU rating represents a staggering 25 times increase over a typical garden hose spray nozzle. A commercial pressure washer rated at 4 GPM and 4,000 PSI is an incredible 16,000 CPU. It is not difficult to see the difference in efficiency. However, this is all true within a range. If you have extremely high pressure and low volume, you can cut steel or concrete (water jet cutter), and if you have extremely high volume and low pressure, you have a river. Neither of these would be very good for cleaning your house or driveway. 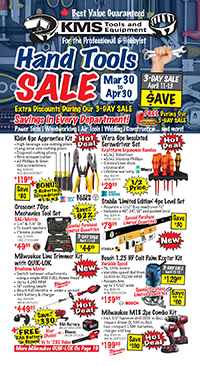 Shop pressure washers and accessories! Pressure washer pumps have pistons and valves similar to a gas engine or an air compressor. On some pumps the pistons are driven by a wobble plate. On others, the pistons are driven by a crankshaft. Crankshaft-driven pumps are generally built better and will last longer. This is the part of the pressure washer that receives water from your hose, and pumps it through a tip at high pressure. There are several common types of pumps that you will see in commercial and home-owner type machines. 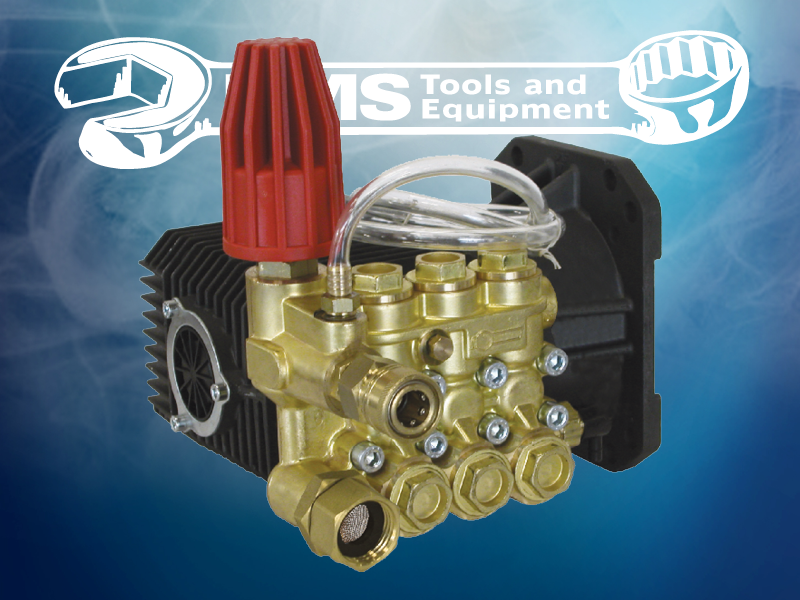 All pressure washer pumps have pistons and valves similar to a gas engine or an air compressor. On some pumps the pistons are driven by a plate on an angle (wobble plate), and in other cases the pistons are driven by a crankshaft. Crankshaft driven pumps are generally built better and will last longer. Low-cost pressure washers have pumps with very low life expectancies—some as low as 60 – 100 hours. When buying a pressure washer, make sure you find out the life expectancy of the pump. If the information is unavailable, stay clear because it is very likely that the manufacturer does not want you to know how low it is. Another very important factor to consider is parts availability. KMS Tools was a warranty/service centre for some low end brands, however lack of parts availability and unreliability of these machines were such a problem that we decided to no longer provide this service. Before buying your machine, ask where you can get parts if you need them. KMS is often referred to by other retailers as a source for parts and repairs for numerous brands that are pretty much disposable. If you are buying a new machine for $200.00 or less, expect it to be a disposable machine that might last you only one season, and be prepared to spend a lot of time to get the job done. The drive describes how the motor is connected to the pump. Direct-drive systems are most common. The pump is bolted directly to the motor or engine with a shaft coupler. Compared to a belt-drive system, direct drive requires fewer parts and space, resulting in a more compact design. Direct drive is also considerably more economical than an equivalently rated belt-drive machine. Belt-drive systems are typically seen on industrial platforms. The pump on a belt-drive unit turns at a much slower speed. The belt absorbs vibration that would wear out a unit faster. Since the pump turns at a lower speed all the pistons and valves in the pump are larger. All this adds up to a cooler running machine that will last considerably longer than an equivalent direct drive version. However, there is slightly more maintenance and considerably more dollars involved (10 – 30% more). If you are using your pressure washer on the job, then you want to consider buying a belt-drive machine. However, an equivalent direct-drive machine will have the same performance for a lot less money. On a pressure washer, the engine or motor powers the pump. The more powerful the engine or motor (rated in HP), the greater the PSI and GPM the pump produces. Gas engines are typically designed to last between 300 and 3,000 hours. The motors on electric pressure washers usually last longer than the pumps. Electric motors are very low maintenance and fairly quiet. There is also no exhaust so they can be operated indoors or in poorly ventilated areas. A typical electric pressure washer that is 115 Volt and 15 Amps will be fairly light duty because it is built for the low-price market. The motor is not strong enough to generate much pressure or volume. While electric pressure washers are compact and usually portable, most jobs take longer with a light-duty electric pressure washer. Heavy-duty electric pressure washers are available for applications where power is available and portability isn’t a factor, and exhaust from a gas engine would be a problem. Gas pressure washers are larger and heavier and mounted on a cart with wheels. Some are better balanced and easier to maneuver. Gas engines can produce more power and are a lot more mobile as they do not need to be plugged in to an electric power source. Since gas engines can be more powerful, the pump can generate considerably more PSI and GPM so that they can clean faster and deeper than any 115 Volt rated electric pressure washer could. However they do take a little more maintenance and cost more to operate. They must be used in well-ventilated areas because of the emission of carbon-monoxide fumes. Without accessories, your pressure washer is fairly useless. It would be like having a drill without any drill bits. You probably want a 50 ft length hose. If you go shorter, you will have to keep moving your machine. Make sure you get a quality hose with the proper PSI rating to match your machine. A poor quality hose will break down faster, is more susceptible to leaks and kinks, and will usually be less flexible and harder to work with. The wand includes a handle with a trigger valve, and different lengths and angles of wands are available for different applications. You can change the spray pattern by changing the tip at the end of the wand. Most pressure washers come with a selection of tips—from a very narrow spray to generate higher force at the tip for deeper cleaning to a wider spray that has less force but covers more area. Most tip sets also include a low pressure tip for applying cleaning solutions. A dirt blaster or rotary nozzle attaches to the end of your wand. It has a very narrow spray that spins in a circular motion very rapidly. Dirt blasters are effective because they can quickly clean hard surfaces very well and, when used properly, avoids the tiger striping effect on your driveway that happens with conventional spray tips. For cleaning out-of-reach areas, look for an extension wand that’s adjustable up to 24 feet in some cases. Extension and telescoping wands are beneficial if you need to reach up high. They can save you from trying to pressure wash while standing on a ladder. A gutter cleaner is a simple hooked extension that affixes to the end of your wand. It lets you get into your gutters to clean them out. A Whirl-A-Way is an accessory that looks a little like a lawn mower and has two rotating nozzles inside. They are available in sizes from 12” to 24” and excel at cleaning large flat areas. Hot water pressure washers are commercial machines with built-in water heaters. The cleaning effect of the machines is considerably better than a cold water machine with comparable PSI and GPM because hot water simply cleans more effectively than cold water. Hot water pressure washers break down and remove dirt and grime faster than cold water pressure washers, and often eliminate the need for expensive chemicals. Do not feed hot water into a normal cold water pressure washer pump. The heat will damage seals and o-rings. Detergents can greatly increase the speed of cleaning and help remove tough stains. Most pressure washers come equipped with a venturi tube that will draw in the detergent from a bottle or pail and add it to the water stream. The detergent should be first applied with a low pressure spray, given some time to do its work to break down the dirt, and then washed off with a normal high pressure spray. If you are a home owner, you will probably use a pressure washer less than 50 hours per year. In this case getting a machine rated for 500 hours will last you up to 10 years if properly maintained. However, if you are using it on the job, you will want something rated for 2,000 hours or more. If time is important to you, buy as big a pressure washer as you can justify. A 13 HP gas pressure washer will clean your driveway about 10 times faster than a small electric unit. It will also last longer because it doesn’t have to run nearly as long to do the job. Finally, plan in advance what attachments you will want in the future and make sure that the pressure washer you buy has enough power to support them. 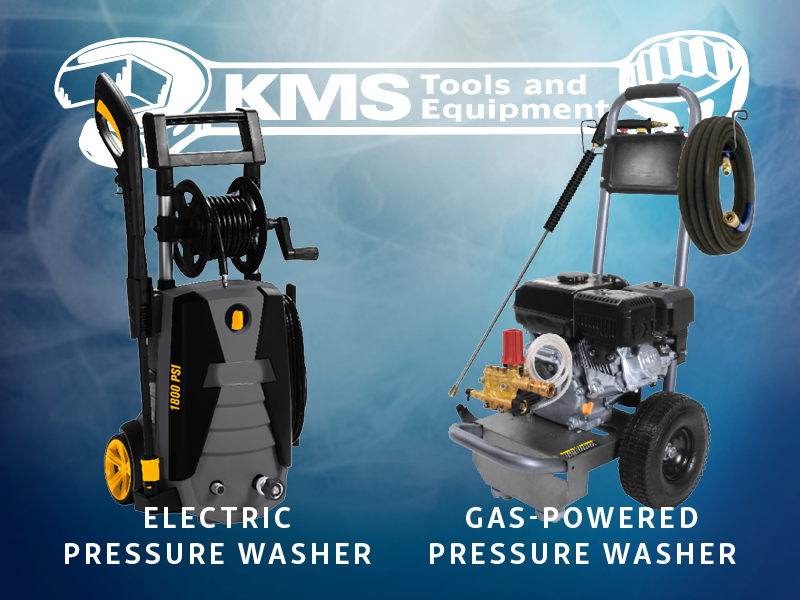 At KMS Tools, we stock a full assortment of pressure washers, fittings, nozzles and adapters. We also have a full-service repair shop in Coquitlam. 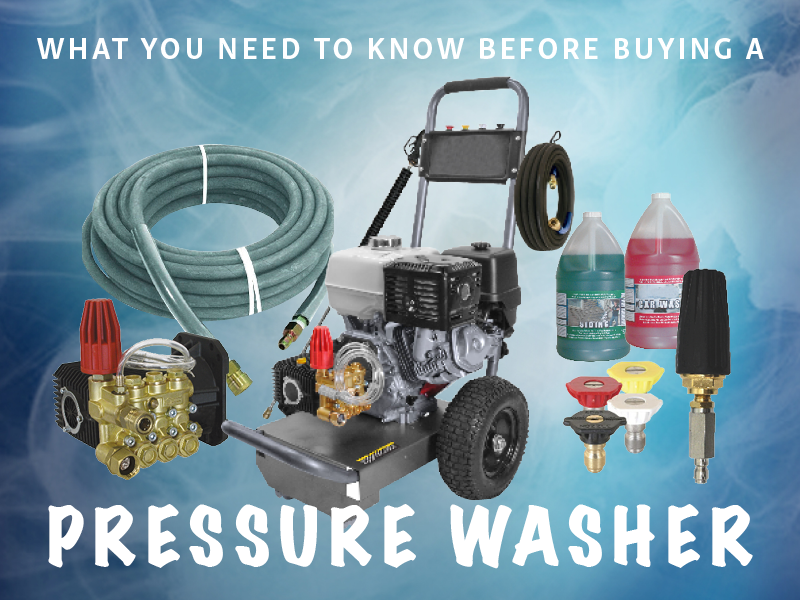 Updated in 2017, this guide covers pumps, engines, drives, accessories, detergents and both hot and cold water pressure washers—everything you need to know to buy the right pressure washer for your application. 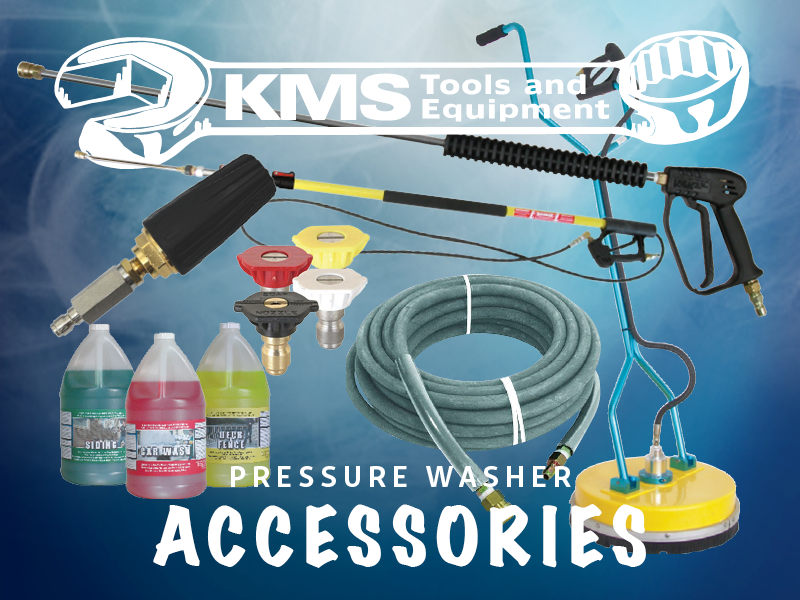 Download this extensive PDF here and when you’re ready to buy, check out our great selection of pressure washers and accessories. If you’re interested in reading more about accessories, have a look at our Top 5 Pressure Washer Accessories post. This entry was posted in Archives, Buying Guides, Shop Equipment and tagged BE Pressure, Pressure Washer by Your Friends in the Tool Business. Bookmark the permalink. I purchased an entry level gas model from Canadian Tire a few years ago. We don’t use it very much, only to wash the driveway, the car/truck and the vinyl siding on our house. It is very hard for my wife to start, it is loud, it vibrates so bad it “travels” constantly even tho it has rubber feet and the worst part is that it does not seem to have a “bleeder” valve (this is my own description). When I take my finger off the trigger, the gas motor wants to stall because of the increased pressure build up. Is this a common “problem” with some machines or do I have a faulty machine? Although the gas motor gives you the ability to move around without an electric expention cord, for our purposes an electric would have been much easier and pleasant to use (noise, vibration, ease of starting, etc.). I am tempted to “garage sale” this one and purchase another. Your article contained some good info, thanks for supplying that, but did not make any mention of the “bleeder valve” issue that I have. I must either have a poorly made machine or a faulty one. Very good and informative info!!!!!!! Thanks!!!!!!!!!!!!! I’ll break up your questions so it’s a bit easier for you to follow. Q: Why is it hard to start? A: If you hold down the trigger when starting, that will alleviate the pressure, making it much easier to start. Q: Why does it vibrate badly? A: Usually a pressure washer will vibrate badly because of a cheaper engine that’s not balanced properly. Also, most single or two cylinder engine are rough because there are not enough cylinders to balance out the firing of the cylinders. It’s like when you’re driving in a car with an inline-4 cylinder opposed to a V8. V8’s are much smoother because of the extra cylinders firing closer together. Q: Why does the pressure washer want to stall when letting go of the trigger. A: This can a few things, all of which point to the unloader. When you are refering to a bleeder valve, I think what you’re talking about is what’s called an unloader. Most decent pressure washers have one, but they can have a fixed unloader on more economical models. If your unloader (usually a large knob attached just off the manifold by where you hook up the hose) is tightened all the way down, there will be a large build up of pressure in the manifold which will cause this stalling problem. It could also just be a clogged or stuck unloader. Either way, you can bring it into our service shop and have them look at it. 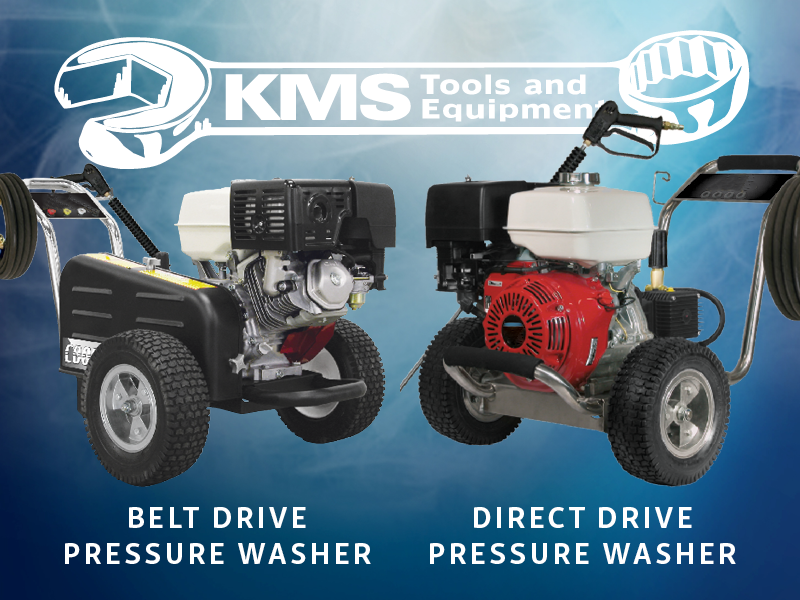 We have a couple different models in stock that might suit you, both of which are made by a company in Abbotsford(support local) by the name of BE Pressure Washers. How’s that for a convoluted answer? If you have any other questions, I’m here to answer. Is the BE P317RX the same as the PE-3170RWX on the BE website? I just want to check the stats as you have clearly defined for us. Does the unit at KMS come with any accessories such as hose nozzels etc. The KMS website is pretty sparse on the description. Great Write up on pressure washers. Does it have a Rotary cleaner like Briggs and Stratten. The live expectancy of the BE-P317RX is 500-600 hours. I’m not sure what you are talking about with the rotary cleaner. Are you talking about a dirt blaster or a Flat Surface Cleaner? Briggs and Stratton just builds low grade motors, they don’t build pressure washers. Generally speaking, if it has a Briggs and Stratton motor, it’s not a very good pressure washer. This pressure washer comes with a Power Ease motor which is essentially a Honda Knock-Off. It’s actually a great little motor that we’ve been selling on pressure washers for years. BE Pressure out of Abbotsford have designed and build this motor for quite a few years now. I think you’d be very happy with this pressure washer. I have the above power washer BE317 with the Power Ease engine for several years now and I’m totally satisfied with this unit. I would not hesitate to recommend it. Low water pressure has become big concern now a days and well, You describe the good details for increase low water pressure. High pressure cleaning is great tools for cleaning exterior surfaces and outdoor items. Very good article about buying a pressure washer. Helps deciding very easy. I’d like to buy my own pressure washer soon and its a joy reading this kind of helpful article. The article seems very interesting. Will definitely try their services and will make sure to follow their tips and suggestion in this blog. Good one…! Avery good article to read.